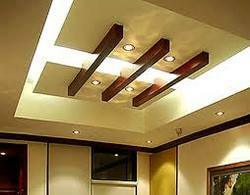 We are a leading Wholesale Trader of pop false ceiling and modern false ceiling from Gurgaon, India. Being a client-centric organization, we are engaged in offering an attractive collection of Pop False Ceiling which is widely used in interiors to add to the charm to place. At vendors' end, the offered ceiling is manufactured using high quality raw material in line with modern market trends. Before final dispatch, our provided ceiling is thoroughly checked by a team of quality controllers against varied quality parameters. We provide this ceiling in various designs and dimensions as per the detailed requirements of our clients. 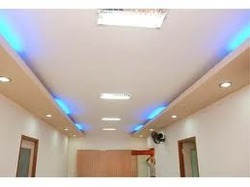 Clients can also avail this ceiling from us at pocket-friendly prices. With enormous experience in this domain, we have established ourselves as the most reliable trader and supplier of Modern False Ceiling. Procured from authentic vendors of the market, the provided ceiling is widely used in residential and commercial buildings for acoustic purposes. Widely known for its elegant design and perfect finish, our provided ceiling is available with several specifications as per detailed requirements of the clients.